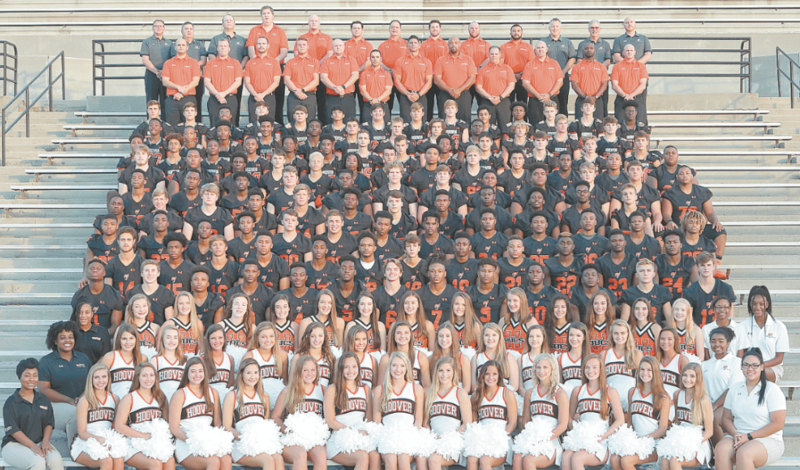 Members of the 2018 Hoover High School varsity football team include: George Pickens, Kaulin Jackson, Will Reichard, Larry McCammon, Jabari Moore, Nick Curtis, Zach Elam, Omari Brown, Myles Spurling, MJ Rogers, Javion Underwood, Cooper Tullo, Ben Trulove, Jack Mayberry, Seth Parker, Connor Dubble, Robby Ashford, Xavier Long, Levi McCree, Josh Lundy, Matthew Palmer, Brian Porter, Codey Martin, Kory Chapman, Ladarius McCammon, Dylan Pauly, Simeon Palmore, Lloyd Hill Jr., Isaac Lovoy, Anthony Hayes, Messiah Tolen, Kobe Williams, Blaine Crook, Jalen Jones, Jesse Kelley, Kam Whitaker, Joseph Davis, Marcus Williams, Cedric Smith, Chris Mack, Tyler Jones, Nicholas Young, Constantine Hontzas, Vinze Moore, KeVunn McConnico, Xzaviah Horton, Josh Smith, Ben Hendrix, Ryan Caldbeck, Greg Russell, Brooks Brymer, Kam Robinson, Drew Tountasakis, Aarren Smith, Sam Suswam, Cameron Johnson, Jaylen Pippen, Jeppa Kilgore, Kristopher Shelley, Carter Short, Xavier Williams, Reed Watson, Nick Paradise, Brandon Goodwin, Harrison Ozgun, David Bodden, Tyler Chamblin, Ellis Adams, Luke Godwin, Garret Lepkowksi, Ryan Houston, Trey Reynolds, Michael Pettway, Jamari Buye, Jaeden Sankey, Colby Davis, Jonathan Martin, Ray Hampton, Jake Tucker, Kole Allen, Cameron Scott, Carlos Castelleja, Bryce Carnes, Stephen Robinson, Gabriel Pipkin and Alajujuan Sparks. Photo courtesy TCI Sports/Barry Stephenson. 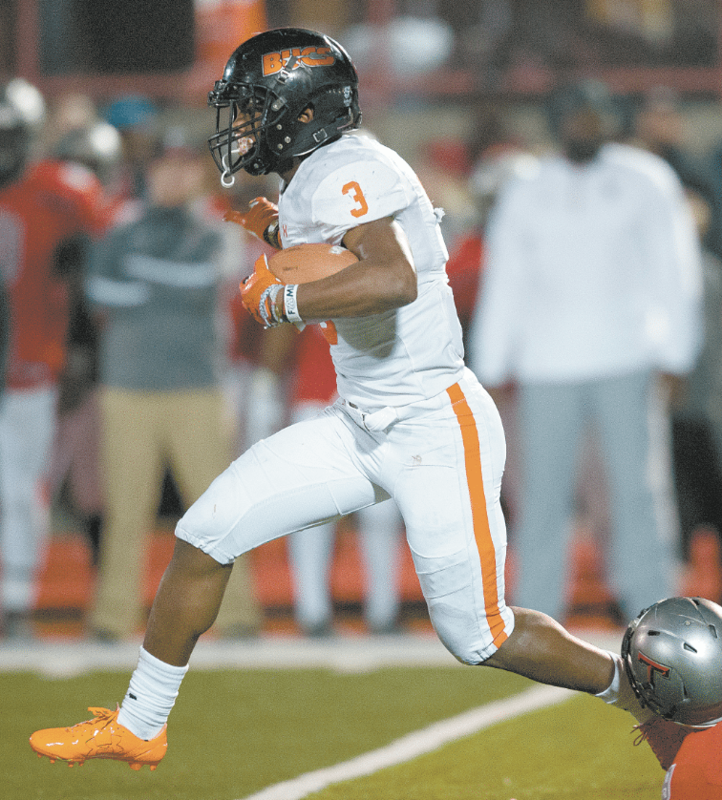 After winning two consecutive Class 7A football championships and five state titles in the past six years, the Hoover Bucs could be excused for allowing complacency to set in. Except head coach Josh Niblett is not about to let that happen. The competition begins on the practice field. If the Bucs are going to stay on top, they will have to do it with a new starting quarterback and a rebuilt offensive line. Quarterback Jalen Parker, who led the Bucs to the 2017 title, has graduated and so have four of the starting offensive linemen who protected him. Ultra-talented Robby Ashford, a 6-foot-4-inch, 210-pound junior, is expected to take over at quarterback. He already has SEC offers from Auburn, Florida, Georgia, Mississippi State and Missouri, although he has yet to start a varsity game. Sophomore Josh Lundy will serve as Ashford’s primary backup. Junior Jack Mayberry is another backup quarterback. At running back, 5-foot-10-inch, 198-pound senior Larry McCammon returns. He rushed for 1,498 yards and 21 touchdowns last year. “He’s probably the best running back I’ve ever coached,” Niblett said. At tight end, senior Kole Allen is back from last year along with senior Brooks Brymer. Fullback Jesse Kelly also returns. 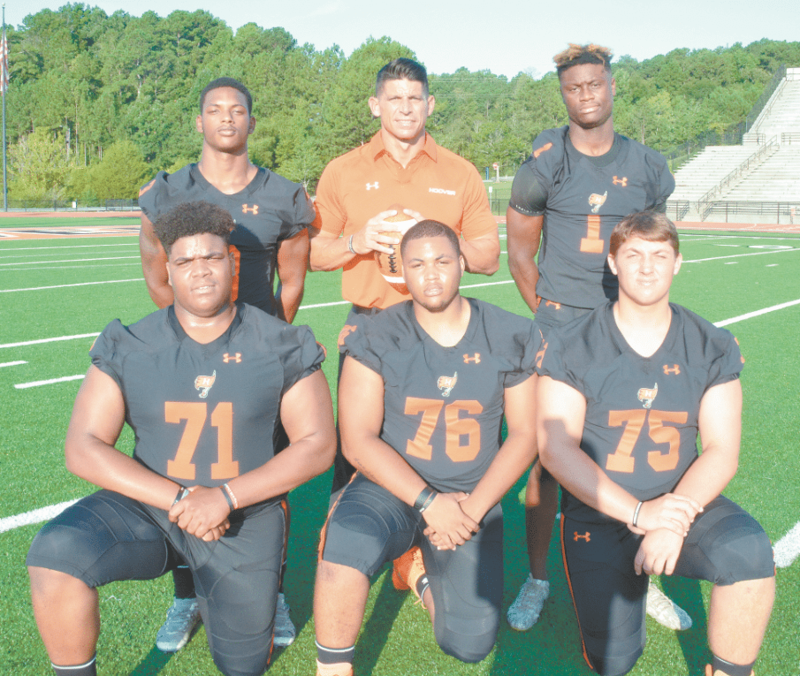 Seniors Zach Elam, Xavier Long and M.J. Rogers, a transfer from Spain Park, also are in the mix, as are Omari Brown, Jamari Buye, Jake Tucker and Cooper Tullo. Center David Bodden, a 6-foot-3-inch, 271-pound junior, will anchor the rebuilt offensive line. Both of his older brothers played for the Bucs. The guards will be 6-foot-3-inch, 320-pound senior Ellis Adams and 6-foot-3-inch, 269-pound senior Ryan Houston. The tackles are 6-foot-3-inch, 276-pound senior Garrett Lepkowski and 6-foot-4-inch, 251-pound junior Harrison Ozgun. Seniors Brandon Goodwin, Trey Reynolds and Reed Watson and junior Luke Godwin will serve as reserves. Hoover key players with head coach Josh Niblett front from left: Ellis Addams, Ryan Houston and Garrett Lepkowski. Back, Larry McCammon and George Pickens. Journal photo by Jordan Wald. On the defensive line, the Bucs will have senior nose guard Bryce Carnes and defensive ends Sam Suswam, a junior, Joseph Davis, a junior, and Ryan Caldbeck, a senior, in their 3-4 set. The outside linebackers are seniors Greg Russell, Kam Robinson and Simeon Palmore and junior Aarren Smith. Russell recorded 18 sacks last season. The secondary will have 6-foot-1-inch senior Jabari Moore at cornerback. Niblett describes him as a “ballhawking, physical cover guy.” The other corners are junior Codey Martin and Seth Parker. The safeties are seniors Myles Spurling and Levi McCree and junior Kory Chapman. “I feel good about the guys we have at the back of our defense,” Niblett said. Senior Will Reichard will handle all the kicking chores. He’s an Alabama commit who is rated as the top kicker in the country in his class by 247 Sports. The Bucs once again will compete in Class 7A, Region 3, always one of the toughest regions in the state. It includes Thompson, Hewitt-Trussville, Spain Park, Vestavia Hills, Mountain Brook, Oak Mountain and Tuscaloosa County. 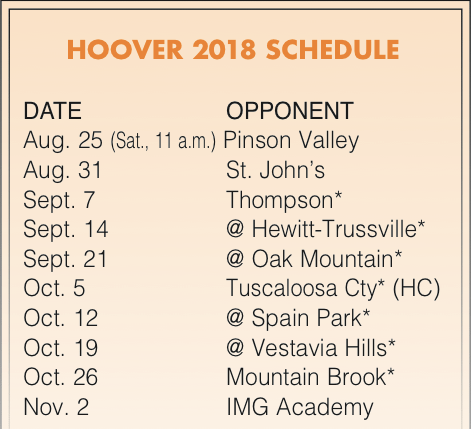 Hoover also will play two out-of-state schools this season, hosting St. John’s College High School out of Washington, D.C., on Aug. 31 and IMG Academy out of Florida on Nov. 2. 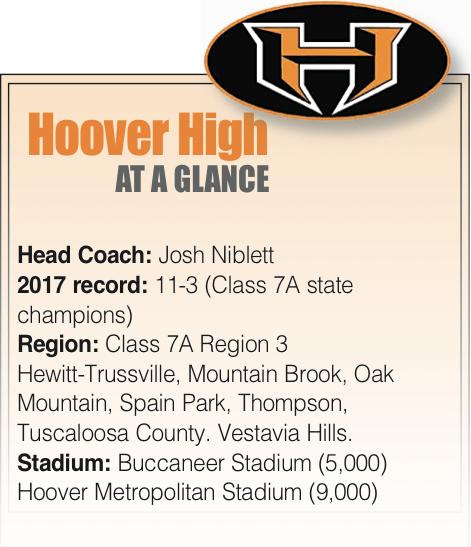 Hoover opens the season Aug. 25 at the Hoover Met against defending Class 6A champion Pinson Valley. The game will be part of the nationally televised Geico ESPN High School Kickoff doubleheader. Hoover and Pinson will kick off at 11 a.m., followed by Hewitt-Trussville against Cedar Grove (Ga.) at 2:30 p.m.